MainAll NewsHaredi Community ‏Will United Torah Judaism party break apart? Will United Torah Judaism party break apart? Rep. of hasidic faction within UTJ says party will leave coalition if Draft Law passes, Lithuanian-haredi reps say 'no obligation' to leave. The Ashkenazi-haredi UTJ party may split into its components: the Lithuanian-haredi Degel Hatorah party and the hasidic Agudat Yisrael party, due to a disagreement between Degel Hatorah and Deputy Health Minister Yakov Litzman from Agudat Yisrael regarding the Draft Law passed on Tuesday. According to Litzman, if the Draft Law passes its second and third readings, UTJ will leave the coalition. Kan Reshet Bet reported that Degel Hatorah MKs Moshe Gafni and Uri Maklev approached Litzman after his announcement, demanding clarification. 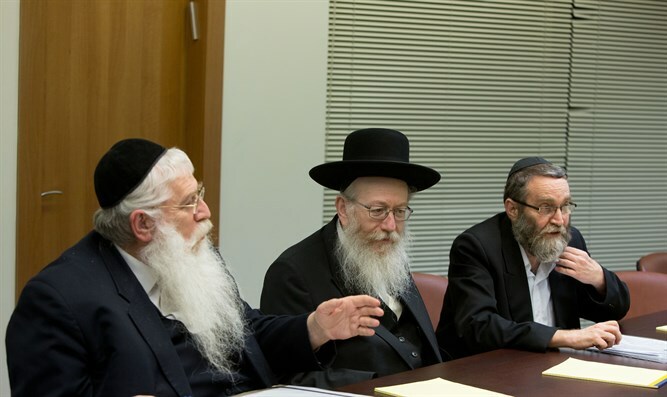 Later, Degel Hatorah sources said that Litzman's announcement "does not obligate them." If Agudat Yisrael left the government, but Degel Hatorah and the Sephardic-haredi Shas party did not leave, the coalition would retain its required number of seats, avoiding the need for early elections. On Wednesday morning, Litzman told the Hamodia newspaper, "Already seventy years ago, before the State of Israel was founded...the president of Agudat Yisrael expressed the stance of faithful Jewry, which sees those who learn Torah as the future generation's hope, and its unconditional desire that everyone whose soul desires Torah and whose Torah is their occupation should be able to [learn] undisturbed. This is how it has been for all these years, and it is our obligation now as well to allow anyone who desires to learn Torah to do so undisturbed." "The haredi community's representatives are busy with a thousand and one issues, every one of which is important and critical. Our partners in the coalition contribute a lot in many areas, but Torah learning is above everything. Because of this, things need to be clear: We will maintain our stance as per the ruling of our Council of Torah Sages, and we will oppose the Draft Law which is now being discussed in the Knesset. If the law passes despite [our opposition], we will leave the coalition. "We believe with prefect faith that there never was and never will be any force in the world that will separate Jews from their Torah and their fathers' heritage."